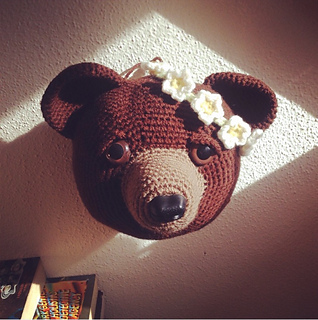 Ravelry: "Taxidermy" Bear Head pattern by Liz H.
"Taxidermy" Bear Head by Liz H.
This lovely bear head is not small, it takes A LOT of stuffing!!! With that said, it’s easy to customize in coordinating colors to match nurseries and bedrooms. Make sure to crochet tightly in order to keep your stuffing from showing or leaking out.